To decompress, I’ve been reading more 18th c. nautical fiction and some feudal Japanese murder mysteries. However, since the passing of Mother Angelica there is this. This entry was posted in Women Religious and tagged Mother Angelica. Bookmark the permalink. I’m sure that this book is a hot seller right now. I am planning on a buying a copy myself. Since I’m assuming that this is Fr. Z’s Amazon link, I may just buy it through here. On a related note, has anyone been able to find the November 1997 recordings of Mother Angelica Live, where she attacks the document “Gather Faithfully Together”, starting the feud between herself and Cardinal Mahony? I have not found any recordings on this yet. Oddly, a friend and I were discussing this yesterday as I only had vague memories of detail. I would like to revisit what occurred to refresh my memory. I was dealing with the death of my 45 year old sister at the time so all my faculties were not engaged. Cardinal Mahoney was my friend’s bishop at the time. Hope someone can locate recordings and post a link. Excellent book! It’s a great read! This book is great. It’s both entertaining and edifying. The parts where she butts heads with certain bishops and gets persecuted gave me some good perspective. It is fascinating to compare where we are now, with our struggles in the Church, with where we were 20+ years ago when Bernardin, Weakland and Mahoney were in their prime. The Audible version is indeed very enjoyable – Arroyo’s imitation of Mother’s voice is uncanny. He did a great job with the other characters as well. It’s like listening to a great radio play. I agree, Mr. Arroyo does an excellent job in the audio book. Agree with those above. Excellent read. Reading this book was like going on a retreat. I enjoyed reading the book at the time. Because it doesn’t attempt to be a hagiography, and brings out very strongly the humanity of Mother Angelica. Father as much as I love Mother Angelica and am saddened by her death, I couldn’t help but notice that you were decompressing by reading 18th century nautical fiction. I stand ready to adhere to your advice on all things theological, but nautically I know from where I speak. Stop reading nautical fiction, especially of that era. The real thing is so much better, number one is the life of Captain Cook, the greatest voyager of all time. I think I better stop, maybe I am bordering on the side of disrespect, believe me it was not my intention. I read it not long after it came out, and I really enjoyed it. Raymond Arroyo did a super job writing this, and it is a fascinating story. You get a real sense of how difficult some Bishops made it for her, and how intimidating it must be to have a conflict with them. They clearly underestimated her, and it’s not always pretty, but Mother was a force. Her faith in Jesus shines through at all times, and He must have been guiding the entire endeavor. And to think she actually was a cloistered nun! It’s almost easy to look back and see all the things God did through her but at the time it was sort of “who is this nun?” She was very “counter-cultural” in the Church in the US at the time. Unless you were part of a group of Catholics who went to the Tridentine Mass no one heard of young people doing Adoration, going on pilgrimages, wearing veils, wanting Latin, devotions, scapulars, Angelic Warfare, etc. and now all that is almost “mainstream”. One does get the idea that she was more than happy to let go and go back into the hidden life. I joked about this to the customer standing next to me. I had no idea the misplaced book was hours away from (we pray) becoming prophetic. Fr. Z. posted a link for her response on the day she died. Scroll back on his blog postings, and you’ll find it. Oops. That was a different response! Lo siento. It was Mother’s scuffle with Diocese of Birmingham Alabama’s Bishop Foley (now retired) that turned me toward Tradition. She had a vision of “Divino Nino” while in South America which sent her back to proper dress and as close to Traditional prayer as possible. Bishop Foley (known as the ‘Smiling Bishop’) noticed that Mother’s televised Mass showed the priest facing the altar of God rather than the people and forced her to stop. Funny thing though, after he retired in 2005 shortly after receiving me into the Church, he began to he began to pray the TLM as mentioned on this blog (http://wdtprs.com/blog/2008/05/n-alabama-tlms-available/). I read the book when it came out and would like you to know when you get to that chapter that Bishop Emeritus Foley has seen the error and has been trying to make amends. @catholictrad, I attended the TLM in Birmingham, AL regularly until I moved. Bishop Foley has now celebrated High Mass many times for the community in a most beautiful and reverent fashion! I read this book not long after visiting EWTN with a female friend in 2006, when both of us went to the EWTN 25th anniversary celebration together. That was an unforgettable weekend. In 2001, I had a job where I traveled frequently, and I happened to come across EWTN in a hotel room, where I would sometimes watch a couple shows like Franciscan University Today, Builders of Hope (which was about young adults, and in 2001 I was a Young Adult), and sometimes the Mass. There are times I will watch the Mass on Sunday morning at 7:00 a.m. and then I will go to Mass later that morning or in the afternoon, and the Mass from EWTN helps me prepare for Mass, with a perspective from the homily and a reflection of the readings. Traveling was really my first exposure to EWTN. I will have to find the 60 Minutes broadcast where Morley Safer interviewed Mother Angelica circa 1984 – I wish I had heard of her then. 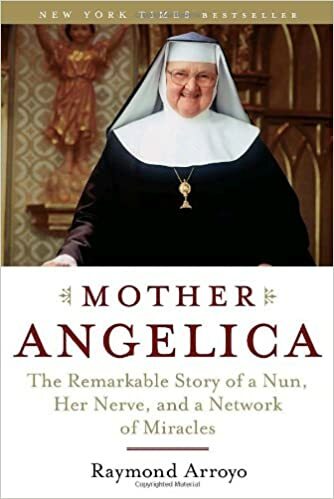 Anyhow, like others have posted, I had no idea of the opposition Mother Angelica faced from certain members of the hierarchy until I read this book. One incident was an interview with an Archbishop, and Mother definitely wanted to keep one of his auxilaries (a progressive) from appearing on EWTN, as well as many other bishops and priests who were touting the liberal agenda (I don’t think Fr. Z wants me to name names, so I will refrain from doing so). EWTN prevailed, and the cable channel the then-USCCB was trying to get going fizzled. Mother Angelica catechized a generation (possibly two or three) that didn’t receive much catechesis growing up. Mother Angelica was a wonderful witness, and made more of an impact on Holy Mother Church than quite a few members of the Catholic hierarchy, either living or dead.